The Other Side of Spartan Sports: A Black Sparty? An interesting suggestion occurred during the October 2nd, 2008 meeting of the Athletic Council, an oversight committee made up of MSU faculty, staff and students. consider adding two additional Sparty models: African American and Hispanic." The idea gave us pause as many thoughts came to mind. What race is Sparty? White? Perhaps Spartan? Sparta was in Ancient Greece, is he Greek? Does it matter what race he is? Then the brainstorming on the logistics of this began. Would it be two totally new suits? Or would we just dress the current Sparty up every once in a while so he looks African American or Hispanic? Is there really any tasteful way to do that? 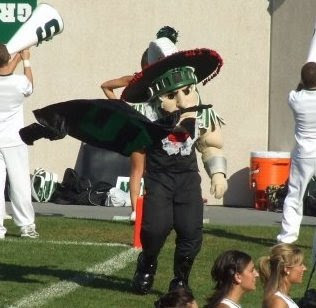 Sparty has toed the line of cultural stereotypes in the past. 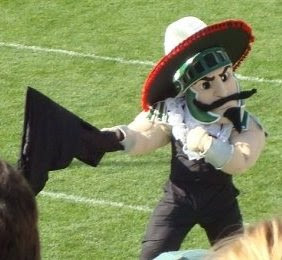 Pictured here is Sparty dressed as a Spanish matador during a football game. Does this honor and celebrate the racial and ethnic diversity of Michigan State? Is it just odd? Or at worst, is it offensive? And how much might all this cost anyway? Now before anyone gets too concerned about this, it seems it was simply a case of thinking out loud that made it into the meeting record. Mr. Francese, a faculty representative on the council, is a Professor in the Department of French, Classics and Italian. When contacted, Professor Francese referred all comment to Athletic Council Chairman Mike Kasavana. When asked about the comment in the minutes, Chairman Kasavana said, "This was an impromptu idea, without actual intent for serious consideration. Nothing further happened or is happening with regard to this suggestion." So, what do you think? Should Sparty be more diverse? Note: We'll be reacting to other items from the 2008-2009 Athletic Council minutes in upcoming days. Stay tuned! Photos complements of Sparty's facebook.com account. I never gave Sparty's race a second thought. I guess I always just assumed that he was a plain ol' Spartan. I think it would be in poor taste to dress Sparty up for special events. The facial hair and sombrero above is almost too much to handle...on an already very cartoonish character, anything like this just looks farcical. Would they bring out all three Spartys at the same time? And where would they draw the racial line? Black, white, and Hispanic are not the only races represented at MSU. If the horse is not good enough for this type of bet, in your opinion, the horse is not worth throwing money on to start with.https://www.jetwin.com/en-us/sports go here and see what is happening in online betting website. At the highest levels where opponents are very evenly match in all areas,Russell Westbrook Workout Supplements one mistake can often result in a win or loss. Envision a mentor advising his charges to clear the balls down the flanks in any intrusion diversion. sport shoes You will be shock what number of players really comprehend why they are advised.